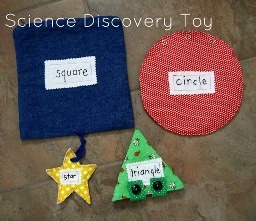 Chris from Pickup Some Creativity shares a tutorial on her blog for this fabric Science Discovery Toy. The soft fabric shapes are also pouches, each with a different kind of closure. Labels on the front show the name of the shapes, and the pouches are sized so that one will fit inside another. Think of all the fun – quiet, non-electronic, no-batteries-required fun – your toddler will have with this neat toy! Go to the tutorial.